Pentagon Says Women Can Now Serve In Front-Line Ground Combat Positions : The Two-Way The process to open combat jobs to women began in January of 2013; Thursday, Defense Secretary Ash Carter made it official across all branches of the U.S. military. Defense Secretary Ash Carter is expected to announce that women can now serve in front-line combat posts. 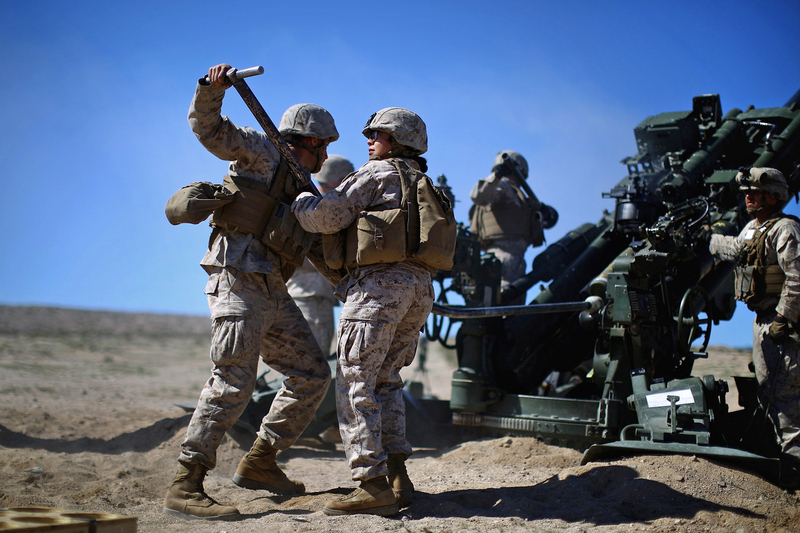 Here, Carolina Ortiz moves away from a 155-mm artillery piece after loading it during a live-fire exercise at the Marine base in Twentynine Palms, Calif., earlier this year, during a months-long study of how women might perform in ground combat jobs. Saying America's military must draw from "the broadest possible pool of talent," Defense Secretary Ash Carter said Thursday that women in the U.S. military — including the Army and Marines — can now serve in combat posts. The formal process to open combat jobs to women began in January of 2013; in finishing that process, Carter acknowledged that in recent years, U.S. women have fought — and sometimes given their lives — in combat posts in Iraq and Afghanistan. Carter made the announcement at noon Thursday; the event was not attended by Marine Gen. Joseph Dunford, whose branch of the service was the only one to request the ability to make exceptions to the new rule. Dunford is now the chairman of the Joint Chiefs of Staff. "There will be no exceptions," Carter said. We're updating this post with news from the event. "One of the qualities that makes America's armed forces the best in the world is that we draw on the talents and skills of our people. When we desegregated our military, it became stronger. In recent years, we ended 'Don't Ask, Don't Tell' and allowed gay and lesbian Americans to serve openly — and it's made our military stronger. Over recent decades, we've opened about 90 percent of military positions to women who time and again have proven that they, too, are qualified, ready and up to the task. In the wars in Afghanistan and Iraq, our courageous women in uniform have served with honor, on the front lines — and some have given their very lives. "Today, the Defense Department is taking another historic step forward by opening up the remaining 10 percent of military positions, including combat roles, to women. As Commander in Chief, I know that this change, like others before it, will again make our military even stronger. Our armed forces will draw on an even wider pool of talent. Women who can meet the high standards required will have new opportunities to serve. I know that, under the leadership of Secretary Carter and Chairman Dunford, our men and women in uniform will implement this transition — as they have others — in a responsible manner that maintains military readiness and the unparalleled professionalism and strength of our armed forces. Together, we're going to make sure our military remains the finest fighting force in the history of the world, worthy of all our patriots who serve — men and women." Carter says the new rule means women in the military who are deemed fit for combat can be assigned to those roles, rather than relying on their own initiative to seek roles in combat. The lack of "absolute choice" for posts and assignments is part of being in the military, he says. Earlier in the briefing, Carter said women can now vie for spots on Navy SEALS teams and other elite units. Update at 12:36 p.m. ET: Selective Service Registration For Women? "That is a matter of legal dispute right now," Carter says, adding that the outcome of that process won't affect his decision. Answering a question about Joint Chiefs chairman Marine Gen. Joseph Dunford's resistance to the idea of full integration of women in combat roles, Carter says he "strongly agreed" with Dunford's idea that the way implementation is handled is the key to the new policy's success. He adds that there's "a great value" to implementing the process on a joint basis, with all branches of the service included. Carter did not directly respond to what flaws he found in Dunford's analysis. In September, the Marine Corps released results of a study that found all-male units perform better in combat than do mixed units. As reporters at the briefing note, Dunford is not attending today's announcement. Listing details about how the new rules will take effect, Carter says no quotas will be imposed on women's numbers in the military. He adds that the military will also have to dispel the idea — held by some men and women in the military, he said — that women might be included in a unit for any reason other than their qualifications. Carter says women's qualifications and the ability to perform combat roles will be main priorities as the new rules are implemented. The process of integrating women into combat roles must begin in the next 30 days, he says. Secretary Carter says the Pentagon can't afford to omit half of America's population from consideration. He adds that since the 1970s, women have been able to attend U.S. service academies, and that in the early 1990s women's military roles were expanded, with each branch allowed to make some exceptions that kept women out of combat. "There will be no exceptions," Carter says of Thursday's change in the rules. Women are being cleared to play a greater role in combat — and vie for thousands of jobs — after the military conducted an internal review of how they might perform in artillery, armor and infantry roles. "Some Pentagon officials, including the chairman of the Joint Chiefs of Staff, Marine Gen. Joe Dunford, have said they worry about the ability of Marine infantry units to be as effective with both male and female troops. Carter is expected to say he'll take Dunford's concerns into consideration in opening the military jobs. "The Pentagon has been opening up jobs to women throughout the Obama administration, admitting women to Navy submarines and to the Army's elite Ranger School." The formal announcement comes as more female service members have been training for roles on the front lines. In August, two female soldiers graduated from the U.S. Army's Ranger School at Fort Benning, Ga. Currently, women make up less than 10 percent of Marine Corps personnel. The announcement comes more than 20 years after women were officially excluded from serving in small ground combat units back in 1994. It also comes three years after a group of servicewomen sued the Pentagon and then-Secretary of Defense Leon Panetta in 2012. Two months after that suit was filed, Panetta announced that women would be gradually allowed to serve combat roles.